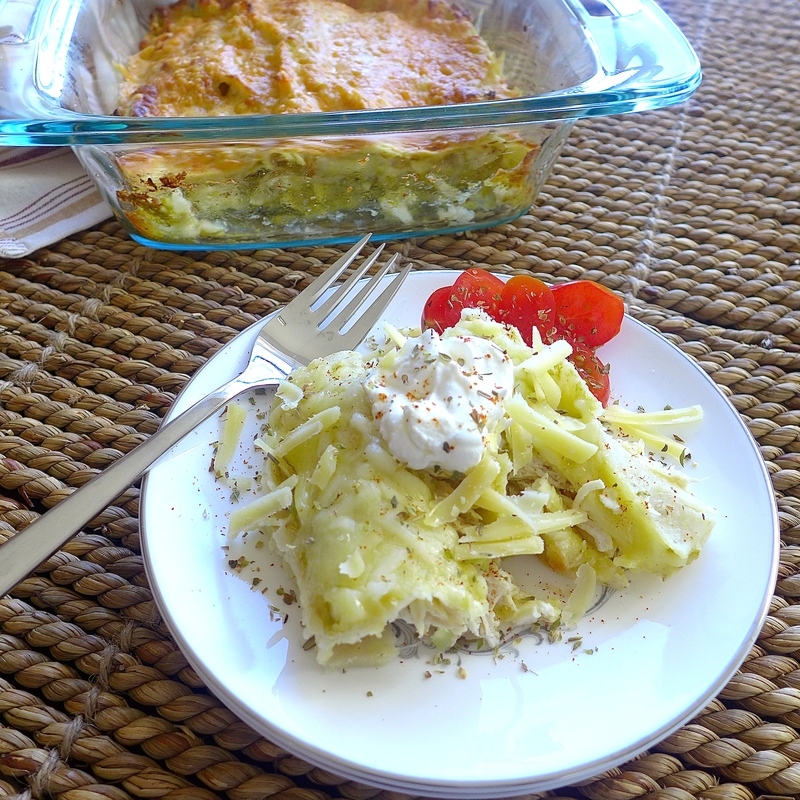 Chicken Enchiladas with Salsa Verde is a light and spicy one dish meal that can be prepared days or weeks in advance. 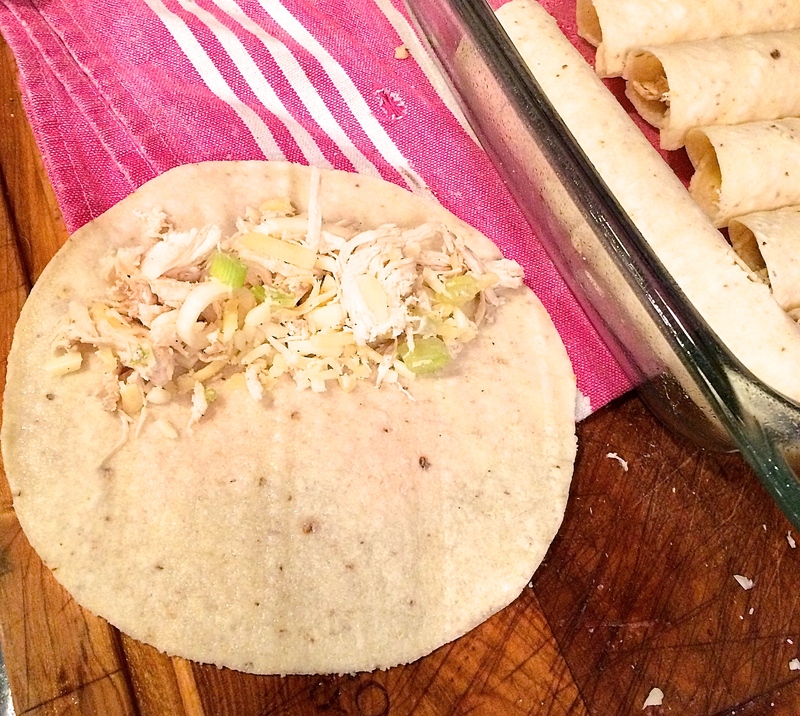 If you’ve never tried to make chicken enchiladas before, this recipe’s for you! Prepare without baking, cover well with foil and freeze until needed. 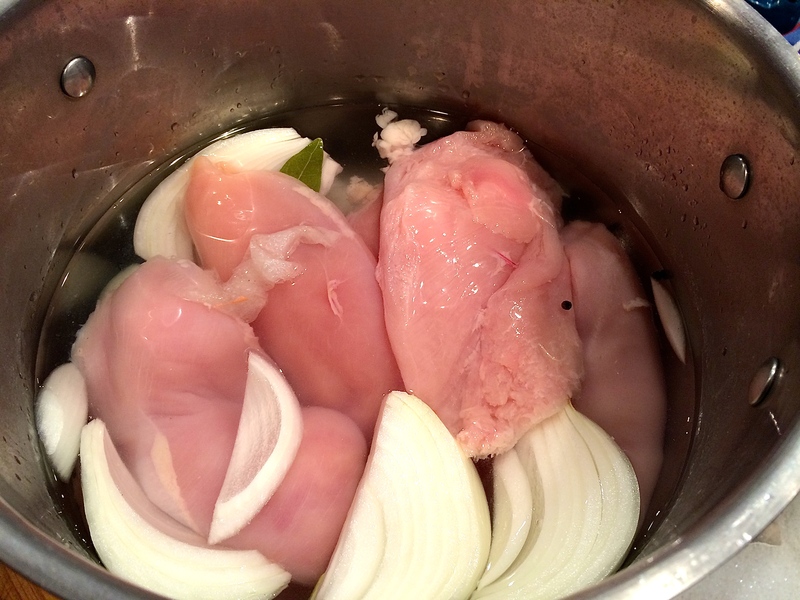 Save time by using store bought, roasted chicken or easily poach your own chicken breasts. Once you get the hang of this basic recipe, make your own variations. Use pork or beef instead instead of chicken. Make a vegetarian version with corn and or beans. 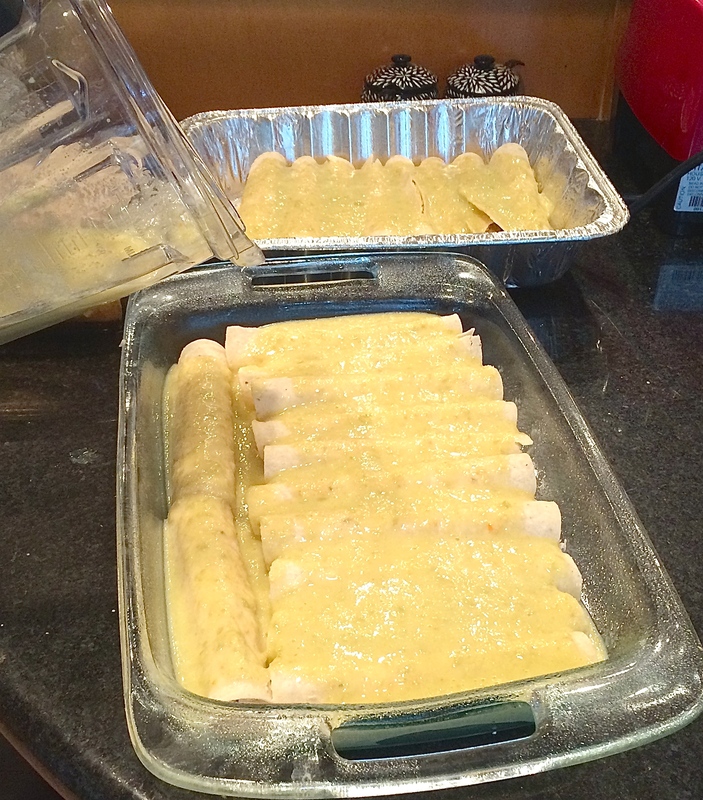 My friend Mary Beth and I made a double batch of these enchiladas over the holidays. This is why quantities shown look larger than the amount called for in the recipe. You can always double this recipe, bake one this week and put the other one in the freezer for another day. This is our favorite meal to pull out of the freezer, bake and serve when our family or company comes for dinner. There are never any leftovers! 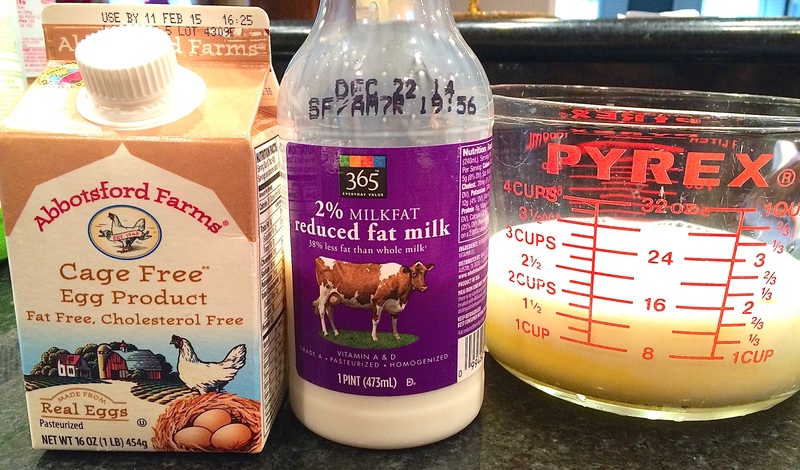 Save calories by using low fat milk and egg substitute. 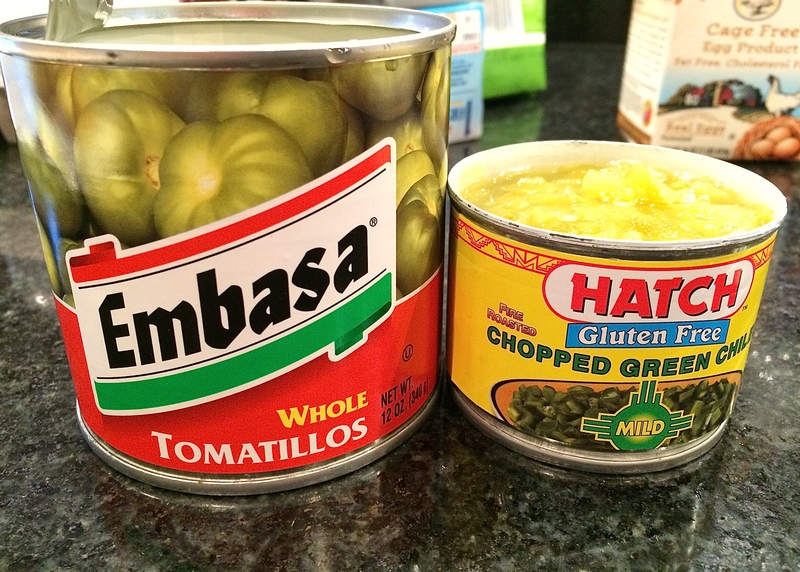 To make the salsa verde, add tomatillos (drained) and chopped green chilies to the egg mixture. 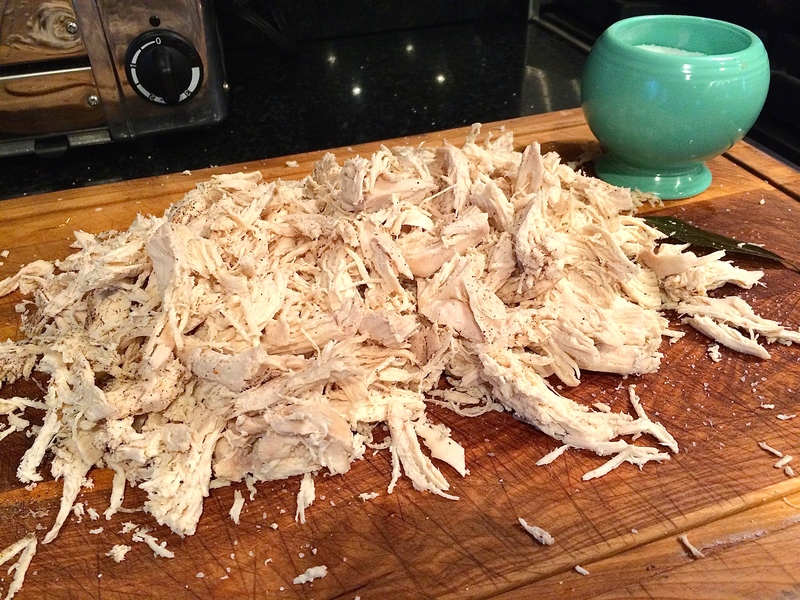 Shred the chicken. Combine with cheeses and chopped onion to make the filling. 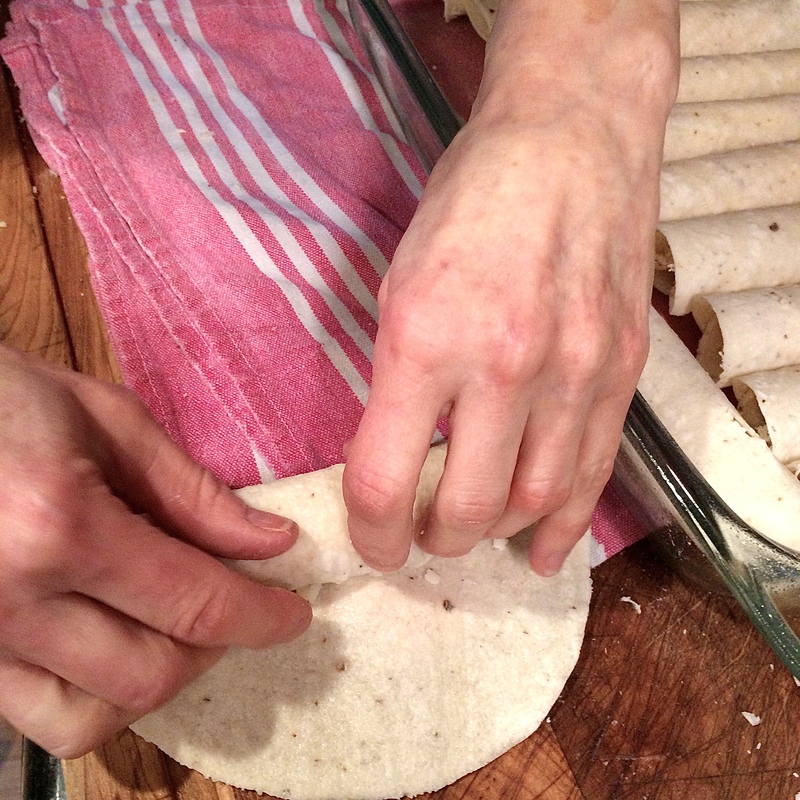 Place filling along the length of the first third of the tortilla and roll up tightly. 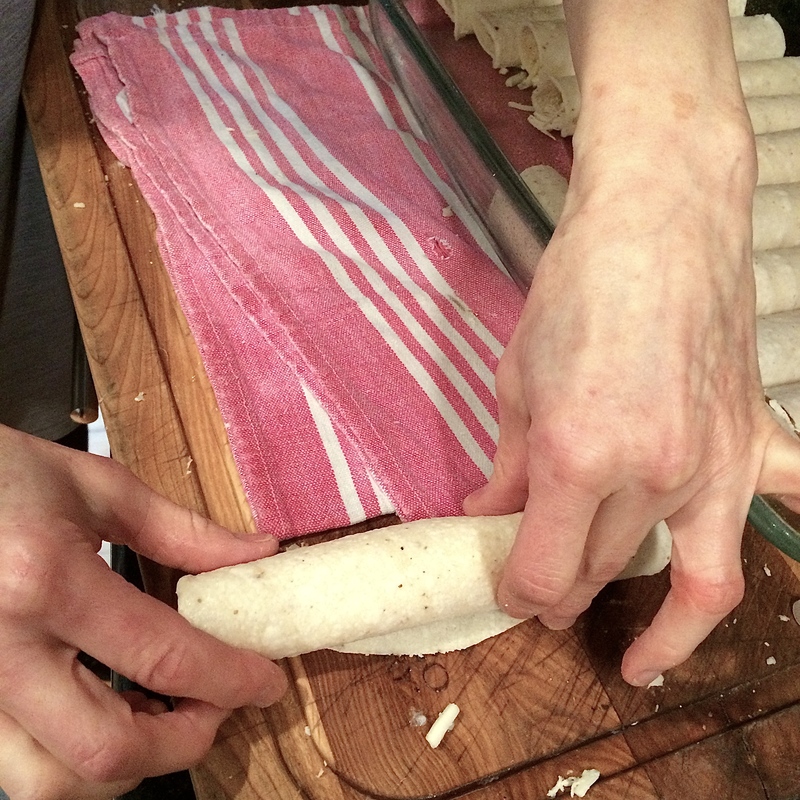 Continue rolling until all tortillas have been filled. If you are freezing before baking, top with sauce and cheese and cover with two layers of aluminum foil. Chef’s tip: Be sure to write the current date on the foil with a sharpie. You could also write “Chicken Enchiladas” and “Bake at 375 F for 30+ minutes”. 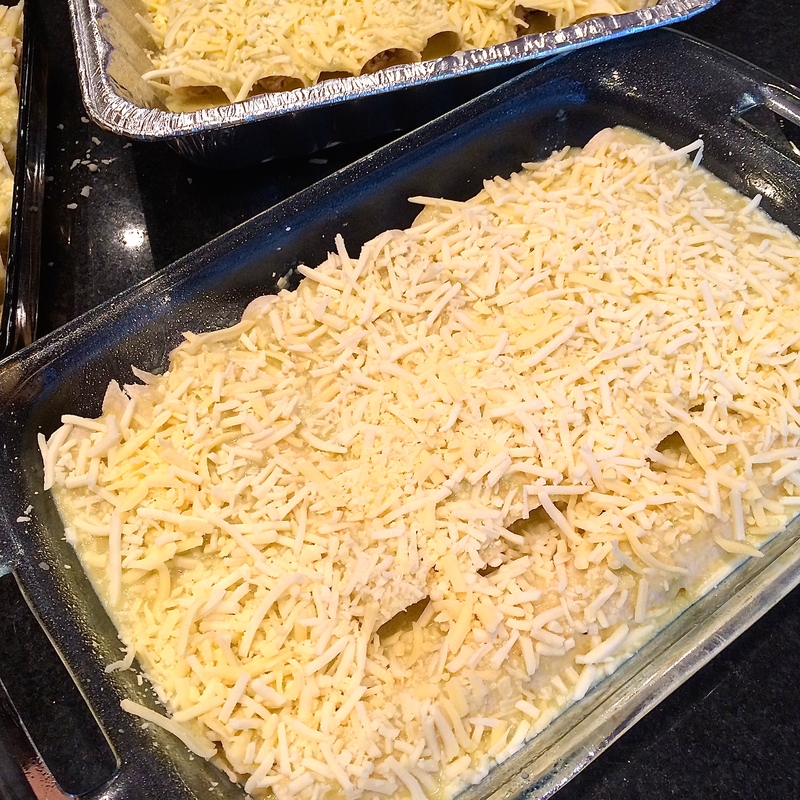 Freeze for up to three months and make a note on your calendar to bake the enchiladas before the expiration date! 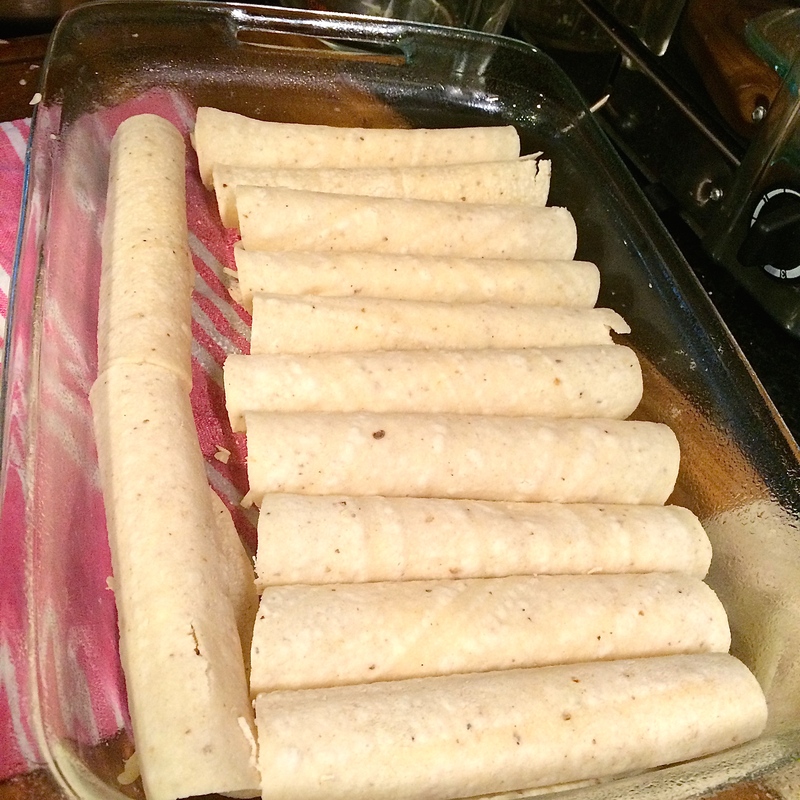 While there’s no need to defrost the frozen enchiladas before baking, they will take longer to cook, so start checking after 30 minutes. Serve with sour cream, extra cheese, salsa and parsley or cilantro. Show us your own version of these enchiladas. 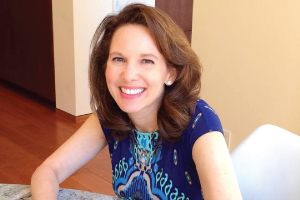 Be sure to Instagram or post them to Facebook with the hashtag #diginwithdana. Dig in to Chicken Enchiladas with Salsa Verde. 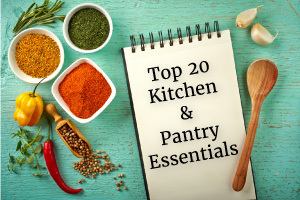 Make ahead meals just got easier and spicier! Adapted from Cooking Light magazine,these easy enchiladas can be made with either store bought or your own poached chicken. Double the recipe and freeze one for busy weeknights or a special dinner. Preheat oven to 375 F. Spray an 11x 7-inch baking dish with cooking spray. Prepare filling: In a large bowl combine shredded chicken, ½ cup chopped onion, and ½ cup each of the white and sharp cheddar cheeses. Taste filling and season with extra salt and pepper, if needed. 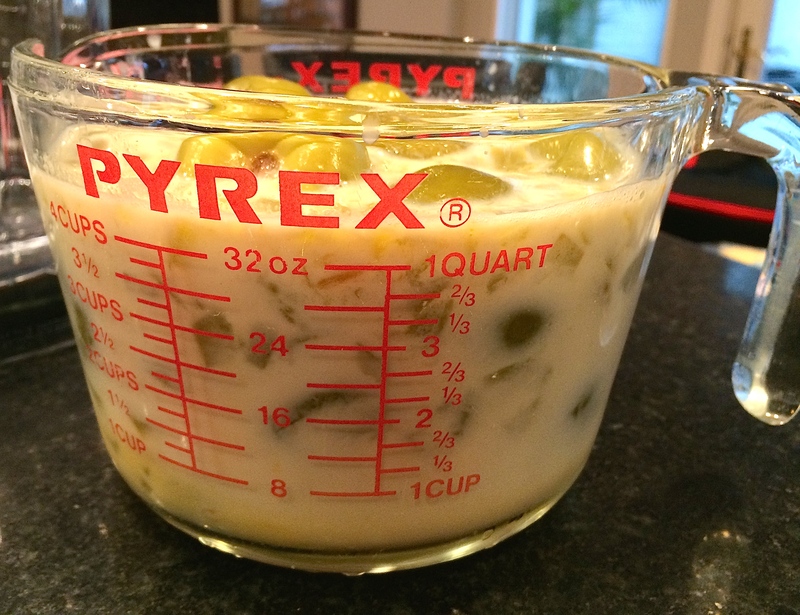 Prepare sauce: In a blender, combine milk, egg substitute, salt, drained tomatillos and undrained green chiles. Pulse until smooth. Fill tortillas: Dip corn tortillas one at a time in the warm chicken broth (one side only) and place on paper towels next to the bowl of filling. Use a 1/3-cup measure to scoop and fill the first third of the tortilla. Roll tightly and place, seam side down in the baking dish. Repeat process, making between 10- 12 or more enchiladas. Pour sauce over enchiladas. Cover with foil and bake at 375 F for 20 minutes. 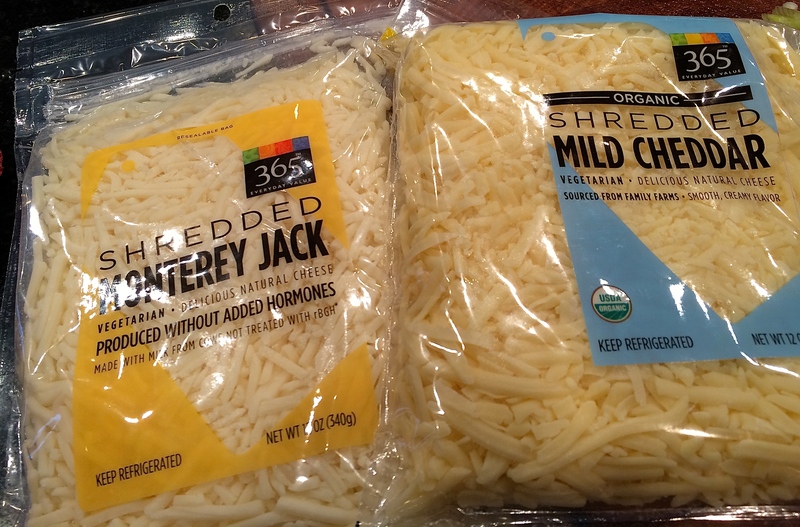 Uncover, sprinkle with remaining cheddar cheeses and bake until the cheese melts, about 5 minutes. Serve with sour cream, extra shredded cheddar cheese, salsa and sprigs of cilantro or parsley.